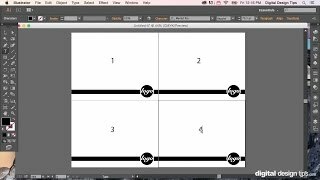 In this tutorial, I will show you how to make a multiple layout in Adobe Illustrator. This provision can also be saved as a PDF file in a multi-page PDF with the right button of the mouse in Illustrator. Awesome. Short and concise presentation. Instead of joining the artboards together and using alt+shift, you can work on one and use the ctrl+c then ctrl+f feature to get it perfect on each artboard, but you just need to click the target artboard before pressing ctrl+f. very helpful. I am a an old print designer from FH 10 days. still running the last version on a dual boot Mac. Learning AI and moving quicker than I expected . thanks for the quick tips. Short and sweet. Thank you! Howdy, I will be making a coupon booklet for a school project and was wondering what adobe illustrator I might need?